This was something the girls had been asking to make all week. 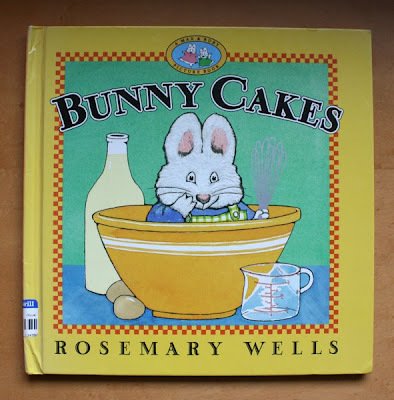 I picked up a copy of Bunny Cakes by Rosemary Wells from Goodwill. Goodwill and Savers are my favourite places for books because they are never more than $1.39, even for the monumentally cool hardbacks, which would set you back 15 to 25 buckeroos a pop if bought new. Of course the library is free, but as a reward strategy, a whole new book for $1.39 kicks the pants off some candy. Anyhoo, this book is one from the Max and Ruby series (also on tv as an animation in the US, on NickJr). 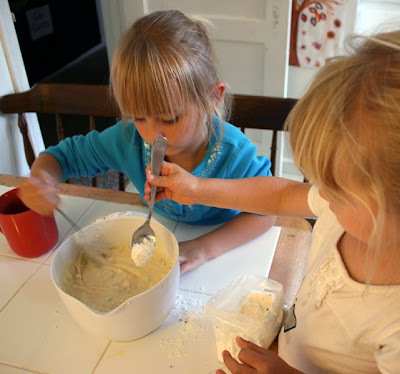 It's a very sweet story about Max and his big sister Ruby making cakes for their grandma's birthday. 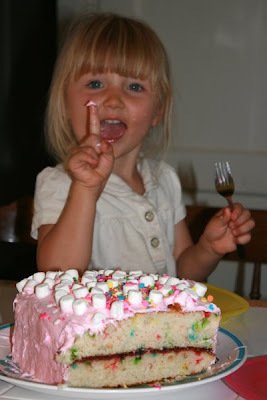 Ruby makes an angel surprise cake with raspberry fluff icing and Max makes an earthworm cake with red hot marshmallow squirters. 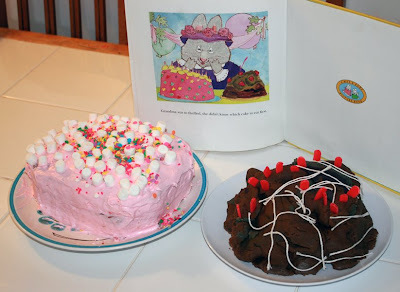 The kids had been asking to make these cakes all week. They really wanted to make Ruby's cake and said Max's cake was gross, so we all made a cake together using a box of cake mix. Yeah, Martha Stewart would have an embolism reading this, but the cake mixes are great for preschooler baking. 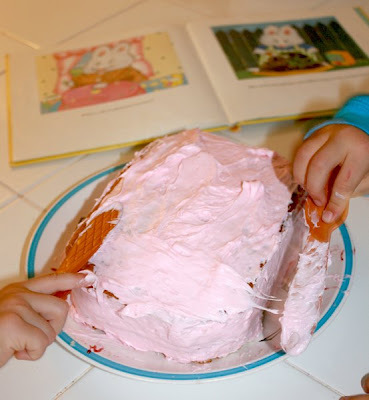 I've got them as cheap as a dollar on sale and the kids drool over the box graphics and photo of the cake, then there's the easy to follow recipe and cooking instructions, WITH PICTURES!!! so it's really easy and fun. 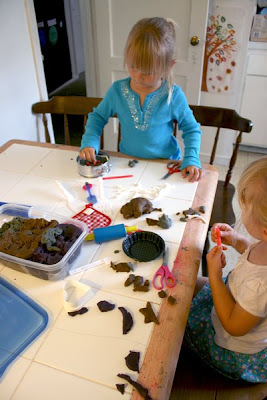 While the cake was cooking the kids played with the many shades of grey and brown playdough that have evolved from all the playdough activities we've been doing recently. They made various reconstructions of Max's earthworm cake with string for worms and cut up bits of these weird red plastic popsicle sticks for the marshmallow squirters. One of my mates gave me a bunch of kid craft gear for my birthday last year and these popsicle sticks were in the bag. They are kind of like corrugated cardboard in structure, but plastic and in different colours. 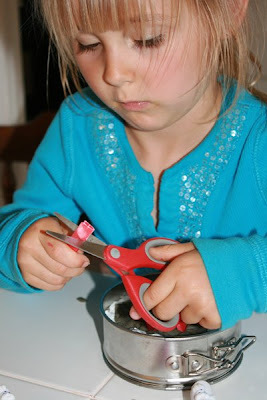 The kids find them really easy to snip up with kiddy scissors, so they worked great for this. 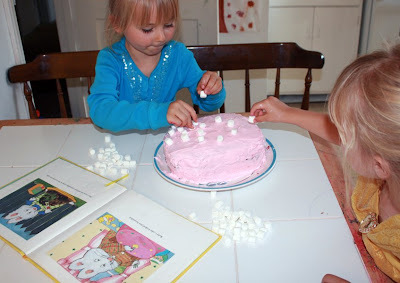 Once the cake was baked I cut it and put jam in the middle, then iced the sides and the kids iced the top and stuck on marshmallows and sprinkles. 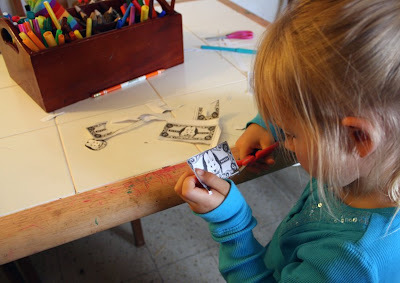 Then, while I cooked dinner (no cake before dinner because I am clearly a fascist dictator), the kids played cutting out and colouring "Bunny Money" from Rosemary Wells' website. Looking around there are some good Max and Ruby games and colouring bits on the web. Some on Rosemary's site and some on Nick Jr, including this awesome Max and Ruby dollhouse puppet theatre, which we will have to do soon because the kids will go nuts for it. After dinner we scoffed some cake and read the book again. Mmmmm cakeface. Can you think of any other children's books about cooking that you've read that could be adapted to allow kids to reinact the story in the kitchen? No, we're not doing George's Marvelous Medicine! I so wanted to do that as a kid. Sigh, my parents must have wanted to murder Roald Dahl for that one. I kinda remember doing Thunder Cake maybe my first year teaching... I don't even remember what the book is about though. Stone Soup! That is a perfect one for little soup makers. So cute and fun! We had birthday cake this week (also from a box). But, I did pick up a cookbook for a few bucks at a local store called Roald Dahl's Even More Revolting Recipes because several of them looked easy enough to pull off with a small child around and most really do appear quite revolting. I expect this could be a good combo when he is officially in his pre-school years! I just recently found your blog. I love it! Thank you so much for posting all of your ideas. You have a great blog!! I'll be back for more inspiration!! I was going to suggest Thunder Cake as well. Great book by Patricia Polacco. She includes the recipe at the end. Your cakes turned out fabulous! How were there any marshmallows left after snacking for decoration? Can't think of any food books off-hand but there's a lovely and funny one called The Seven Silly Eaters (forgot who wrote it) about a mother with seven children who all insist on their own meal. Imagine - seven different meals, three times a day! I get tired just thinking of it. Our girls love that book, and the husband likes reading it to them cos it's witty and rhymes. Have you tried Stone Soup? We love that at our house. One of my 4-yr-old's favorites is pizza - how about Pete's a Pizza by William Steig? When I was a kid, my sister and I loved The Bunnies' Get-Well Soup, and our mom made it with us. Great way to get kids excited about veggie soup! Wow, you are amazing!! I have spent hours reading your entire blog and I have never seen such talent before!! You are so creative and gifted and your children are so lucky. I dragged my fiancee in here to see all your wonderful projects and we both are completely in love with you and your blog. You should (or maybe you do) write kids' craft books or write preschool curriculum and sell it, you could be making a fortune! I hope that someday when I have kids I can be as amazing and creative as you! I'm going to be checking on your blog regularly! Wow! Thank you for all the wonderful suggestions! Lots of books to look into for cooking projects now. Great stuff! I bought an old library copy of The Pooh Cook Book by Virginia Ellison on Amazon, and I love it. So cute. Hurray for Rosa! by Sheila White Samton is a cute preschooler book with several different stories, one of which involves a "Rosa sandwich" (think peanut butter, ketchup, marshmallows...) My 3 year old daughter kept wanting to make one, so my husband made it with her (I didn't have the stomach for it, but they said it wasn't bad). -Just found your blog today and LOVE it. Your ideas are so clever and the way you guys bring them to life is phenomenal! There is a book called "Cook A Book" by Leslie Cefali that lists children's stories and has recipes to go along with each one. Thunder Cake is great. It's about a little girl who lives on a farm with her grandmother. A storm is coming, and she is afraid of the storm. Grandma helps her bake a cake to take her mind off of it. The recipe is in the back of the book. Giant cookies and Cookie pizzas.